Corry Weller knew as soon as she saw her first short-course race in 2006 that she had found her calling. With the help of her husband Jason and their successful UTV business, Corry began racing short course in 2007 in the highly competitive UTV class, going Pro after only her first few races. 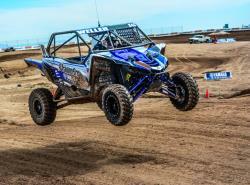 In 2017, the AIRAID-supported driver is pursuing championships in the Arizona Lucas Oil Regional Off Road Series in both the Production 1000cc UTV class and a class she and her husband created for drivers to compete as a reasonable cost, SR1. AIRAID: Corry, you had about a month of between rounds 3/4 and 5/6. How did you keep yourself busy? 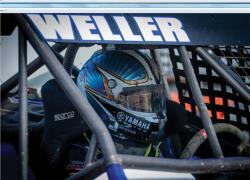 Corry: We were racing in the Lucas Oil Off Road Series with Jason at the wheel in Ensenada, Mexico. AIRAID: OK, now you’re back in Arizona for Rounds 5 and 6. We heard the weather was a little tough to deal with. How did you deal with the heat? CW: We came back for the Lucas Oil Regional Races at Wild Horse Pass, on what would prove to be a very hot weekend. Fortunately, the races were night races, and we would only have to deal with the intense heat for practice and qualifying both days. AIRAID: So how did qualifying for the Production 1000 cc UTV go? CW: Our DragonFire Racing YXZ chassis was still dialed from the Lucas Oil Off Road Race, so practice went smoothly for us throughout the afternoon. Qualifying time came around, and we burned off as many solid, mistake-free laps as we could, putting us barely behind 1st place into a 2nd place qualifying time. With the inversion of two, however, I would be on pole and starting the race - the best place to be! AIRAID: So you’re starting from the pole. What happened during the race? CW: I was in control of the field coming up to the green flag, and as soon as I passed the start cones I dropped the hammer, and away we all went! My Weller Racing teammate, Paul O’Brien was on my outside, and suddenly swerved just a little into my right front wheel, putting me back just enough to where he got a nose on me going into turn one. From that point on, the chase was on, and I stayed glued to him the entire time, making sure he knew I was right there and pressuring him in every corner. AIRAID: Were you able to get back around him? CW: On such a one-lined track, it’s very hard to pass unless you push someone up in a corner, and I didn’t want to do that to my teammate – plus, I enjoy a good challenge! I drew up alongside of him a couple of times as we drag raced into turn one, but he had the better line, and he would get a nose on me every time. In the final lap, on the final corner, I chased him down and drew up next to him again as we raced to the checkers, but he would beat me by a nose! AIRAID: On Saturday night you ran round 6 of the Production 1000 series. How did that go? CW: Qualifying went pretty much the same, with me winding up on the pole once more, with O’Brien on the outside again. This time, I wanted to get ahead of him on the start, and as I hit the start cones, I waited just a second, and then gassed it. We both drag raced into the corner, side by side through turn one, and down the back stretch, and then into turn 2, where he had a better line and I had to give a little not to get into his driver’s side rear. He squeezed out ahead of me, and then I played chase once again. AIRAID: Were you able to get around him on Saturday? CW: I was determined not to let him beat me again, I got creative and tried a couple of new shift points, since I could hear that he was shifting in the air on the bigger table tops. To do that, you had to hold the revs just a tiny bit longer, and you weren’t in peak power for that time. I started shifting up just before the table tops, and that gave me just enough extra speed to slingshot around him and make my pass for the lead just after halfway through the race. Once I was clear, I could run my fast lines, and I kept and extended that lead until the checkered flag! AIRAID: You guys invented SR1 as a driver’s class, rather than a money and horsepower contest. How did you do in the SR1 races? CW: My SR1 qualifying on Friday night went pretty good, and I pulled off a second place qualifier, which again, put me on the pole for the start of the race. During practice I was trying out a new, stiffer swaybar (since mine had broken in the race before), and I liked how it felt. The track was holding a lot of moisture at night, which made traction very different from practice and qualifying. AIRAID: And how did the round 5 race go? CW: I controlled the field in my Optima Batteries SR1 as we rolled through our parade lap, and as soon as I hit my cones, I mashed the gas and off we went! I got into the lead early, and drove as clean and mistake free as I could, which kept me in the lead, despite a lot of heat from several VERY fast racers. I would cross the finish line in FIRST place in the SR1 class – which was my first win in a few rounds! Felt good to get back on the podium after dealing with some issues with my SR1 for so many races. AIRAID: And how did you do in round 6? CW: My qualifier for round 6 wasn’t a good one, as I got into lap traffic too early, and when I attempted to burn off a lap before my last one due to a crippled car that wouldn’t leave the track, I wound up wasting the last lap, which was my fastest, due to that same car suddenly veering back onto the track and trying to go again, right in front of me. So, my third lap was actually my fastest, putting me into a fifth place qualifying position, which was terrible for my points, and put me mid-pack on the start. A pensive Corry before the start of the race. Starts are key on the tight tracks she runs. AIRAID: How did the race go? CW: I piled on the tearoffs, and knew this would be a battle just to get to a podium position with all of the fastest guys in front of me on a very easy track. I held my line on the start, and was actually able to get around several cars within the first two turns, but then I noticed my SR1 was having issues on the low end, whenever I was trying to come out of a corner. It felt like the motor had tightened up on me, and it just wasn’t happy anywhere below 7,000 RPM. I stayed in it, and drove the best race possible, but still only finished in 4th after a lot of battling to stay in that position. AIRAID: Where are you in the points now? CW: In Production 1000 I am first in points with a 14-point margin and in SR1 I am in second in points with six points between me and first.